Temperature monitoring of pharmaceuticals in medical fridges, freezers, storerooms and during distribution helps to verify that they are stored within the specified environmental conditions. It is essential that pharmaceuticals are stored within the correct temperature range to ensure their safety and effectiveness. Tayside Pharmaceuticals is a 'Specials' manufacturer making bespoke medicines for the NHS in-house. The company uses Tinytag data loggers to help confirm that medicines and vaccines are stored under the correct environmental conditions in all areas including fridges, freezers and storerooms, so that they remain an effective treatment when they reach the patient. 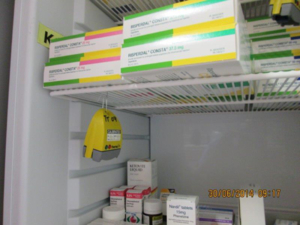 The monitoring also extends throughout the cold chain from dispatch to the dispensing pharmacy. The company has responsibility for the environmental monitoring of clean rooms and medicine storage within their own premises and also in the pharmacy departments throughout NHS Tayside. In total, 81 Ultra 2 temperature loggers are in use. Of these, 29 are permanently committed to monitoring specific storerooms, cupboards and clinical trial materials. The remainder are deployed according to a monthly plan for monitoring different on- and off-site locations. These include, variously, medicines store rooms and cupboards, pharmacy dispensaries, fridges, freezers, media incubators, laboratory drying ovens and pharmacy dispensing robots. These areas are also monitored with data loggers on an ad-hoc basis should an abnormal temperature event occur. The data is used to evaluate the temperature range over an area for a period of time, usually a week, with specific regard to any hot or cold spots, and to verify overall that these areas comply with the limits placed on the specific storage for the monitoring period. If a controllable store is found to be out of limits, the stock inside must be scrapped, the store repaired or condemned, and new stock sourced and stored in an alternate controlled environment. David Hall, Quality Assurance Technician at Tayside Pharmaceuticals, believes the primary benefit of using Tinytags is the functionality of the Tinytag Explorer software, which is simple to use, but comprehensive enough to show the data fully in an accessible format. David also comments, "The battery life of the Tinytag loggers is very useful, especially for longer term projects such as cold-chain mapping. We are exceedingly happy with the results and accuracy of these loggers, and their download speed makes results obtainable quickly."